Charlize Theron made her way back on the red carpet yesterday evening(September 20th) for the Caruso's Palisades Village Opening at the Pacific Palisades, CA. 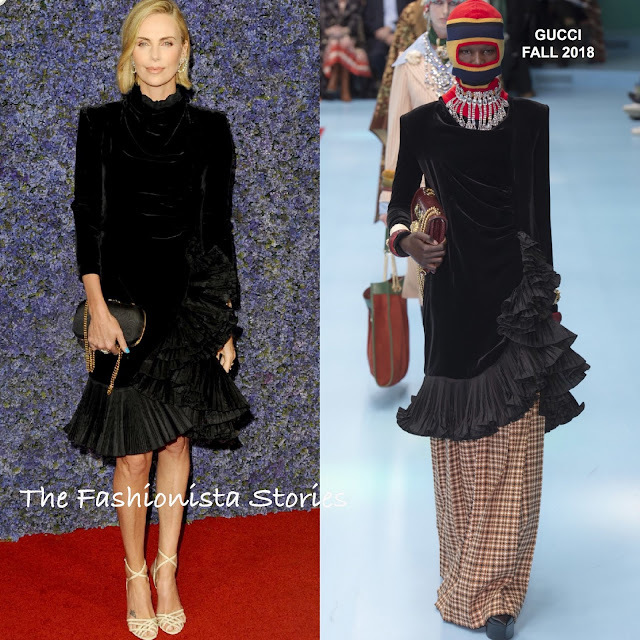 Charlize rarely wears color or prints so seeing her in this GUCCI FALL 2018 black velvet dress is no surprise. The ruffle high neckline, draped bodice and cascading ruffle pleated skirt is what keeps her LBD interesting. A touch of color came via her light blue manicure. Charlize simply pulled off this look. A GUCCI black chain strap clutch & white strappy sandals and silver statement earrings rounded out her look.